I’ve whispered Merry Christmas to you like a prayer and asked God to bless you and keep you safe wherever you may be. You appear to me often in my dreams like the Ghost of Christmas Past and the memories of so many years gone by still make me smile. But just like the movie, the “you” of the past and the “you” of the present are not the same. I have to wonder, does the person I loved all those years even exist anymore? You’ve lost your way right now and the thought of that makes me very sad. I found a photo of us the other day. You are 15 and mama and daddy had just brought me home from the hospital. You are in the living room we never used except for company, sitting on our nicest sofa. You are holding me, your brand new baby sister, grinning from ear to ear. If you were hoping for a little brother instead of another sister, I couldn’t tell by the photo. I guess God gave you the next best thing in me, a little girl who played as hard as a boy. Did you have any inkling then that the little bundle you were holding would follow you around like a beagle pup in a few years, running around half naked and barefoot in the summer heat and hanging on to the back of that tractor while you plowed the fields? We sure had some good times then, didn’t we? 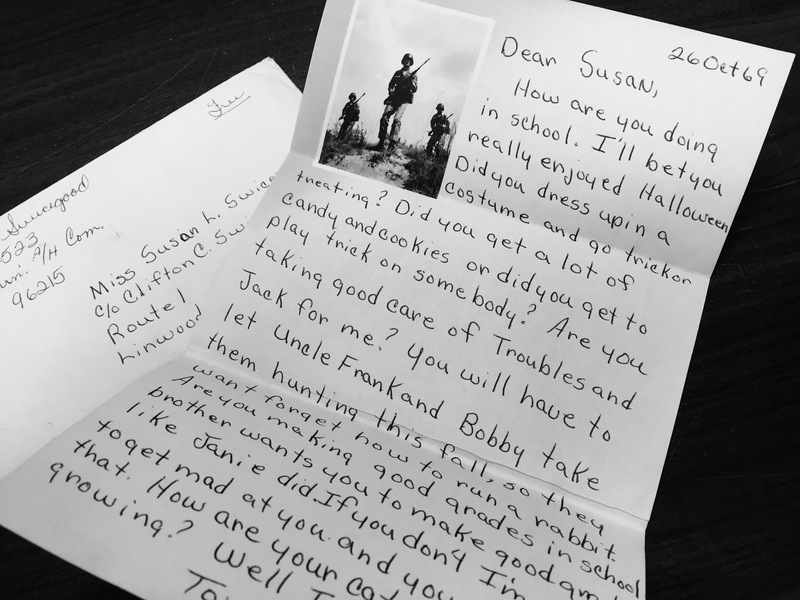 I have the letter you sent me shortly after you arrived in Vietnam in 1969. I was 7 years old and I thought it was the best thing ever that my brother had sent me my very own letter from half way around the world. You wrote it on government supplied stationary and used your best handwriting (which is usually lousy by the way) so I could read it myself and show it off. The paper is thin and I can read between the lines now to see what you didn’t say. You were scared and far from the home, hanging on to the memories, hoping they’d lead you back home one day. You were a good brother to do that, and I want to thank you for remembering me and for reaching out when you were off in the middle of a war. And then, do you remember when Perry and I got in a fight when our dog died? We woke up to find the dog dead. It was a clear cold Sunday morning just like today. Perry wanted to have the dog cremated but I was upset, telling him people in my family didn’t do that, we bury our dead. I was mad as a hornet and I wrapped the dog in a towel and brought him with me down to your house. You were going to help me bury him til Perry called later and said he had changed his mind. I got home to find that he had dug a hole in that frozen earth and we buried old Petey in that cold damp earth. These memories are just a few of the ones I hold, prized possessions that validate the light and the good in you. It nearly ripped my heart out to have to draw that line in the sand with you and say “enough” . As the little sister, it always seemed natural to let you call the shots but I can’t do that anymore. I’ve my own conscious to answer to. I love you so much but there’s nothing I can do to fix this. Your choices are your choices. Still, I’ve lived long enough and lost enough to know that life will simply find a way of going on in that way it does, rolling over those rough patches in life, smoothing them out with time if you give them light and air and don’t let wounds fester. There is so much joy to be had during this season of love and family and I cannot allow my sadness to overcome my joy. I will bake cookies like I do every year. I’ll keep all the traditions, wrap presents, decorate, spend time with loved ones and friends. I will treasure time spent with your children and your grandchildren and will wish that you, the “old” you that is, could be there to share in that joy. My heart will jump when I see their eyes sparkle at the gifts beneath the tree and I’ll remember how you teased me for being that way too, since I was the baby in the family. Christmas is a blessed reminder of how we’ll all be reunited again one day when there’s nothing left to forgive about each other. One of the most painful things about growing up is that you learn some things are just too important to leave it at “agree to disagree”. You reach a place in life you have to take a stand, even when it causes pain. I wish you hadn’t burned so many bridges, but you’d probably say the same about me. Still I wonder, how it is that you came back from the war but over fifty years later you are MIA? So beautiful my precious friend. Sending you big hugs and tons of love!! Susan, this is really good. Thank you for sharing. It’s funny how memories can make the present so bittersweet. Thank you Linda. It’s been quite a lesson in boundaries. Thank you, thank you. You made my evening. I can’t wait to see the ABQ 3 soon and wish you s beautiful and peaceful holiday!